For more than 52 years, we've been showcasing the work of the Central Texas Homebuilders Association. Part of the reason for our success and longevity is thanks to the various sponsors who see the value in our Parade of Homes. We're fortunate to partner with reputable area companies. 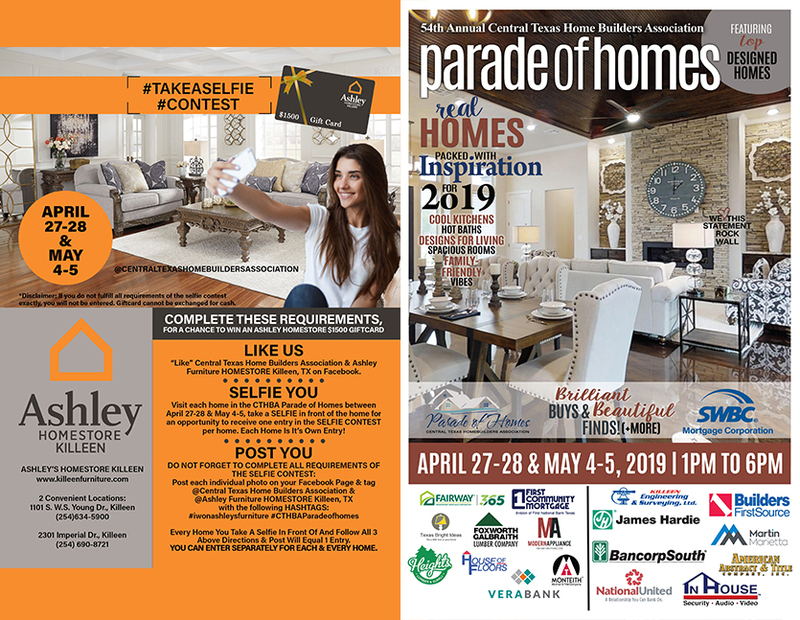 Contact the Parade of Homes today to learn how you can participate in the next edition. You'll have the opportunity to see some of the area's most innovative work and products. It's also a great chance to talk to area homebuilders and remodelers about the project you'd like to complete at your own home. Call 254-699-6964 today to learn more about our next Parade of Homes. Thank you to the sponsors who helped make the 52nd annual Central Texas Home Builders Association's Parade of Homes a huge success. SWBC Mortgage, House of Floors, Union State Bank, 195 Lumber Company, Texas Bright Ideas, Heights Lumber Supply, Ellis Air Systems, Fairway Independent Mortgage Corporation, First Community Mortgage, First State Bank, InHouse, Blackacre, Modern Appliance, Monteith Abstract & Title Company, National United, Killeen Engineering & Surveying, Ltd.
Download our mobile app to stay current with the Central Texas Home Builders Association and in contact with Executive Officer Teri Stermer.